Edition Statement 2nd Updated ed. About.com (5 star rating)"This is a fat, 250+ page guide that takes you from inspiration to completion. I am not exaggerating when I say "complete," either. 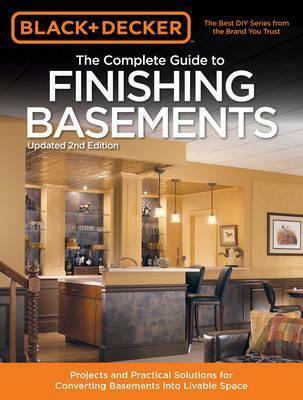 For instance, the guide not only presents you with at least six different basement flooring options, but goes into intricate detail about how to install each type of flooring. "How do these Creative Publishing guides excel? The images. The images are what make these Black and Decker guides. As with previous guides, we still have the same elaborately constructed sets populated by a diverse set of people--everything well-lit and professionally photographed. "Younger readers may be startled by the professionalism of these images. To these readers, the images may not seem 'real' enough. If you want 'real, ' spend a day or two searching for user-generated content online and see what kind of basement you'll be able to finish from that advice. After squinting at grainy, darkly-lit photos (accompanied by little or no text narrative) taken by irritable DIY homeowners, you'll be praying for a crisp and clean view of the project at hand."